HIS PROBLEM STARTED when he tried to give away money. Shaun McCutcheon believes in giving to charities like Feed the Children. He also believes in giving to political causes and campaigns; he thinks it will make America a better place. But if he acted as he wanted to on his political beliefs, he could find himself behind bars. The threat of a five-year penalty for contributing his own money to a political cause struck him as un-American. So he went to the Federal Election Commission and then to court. The federal campaign law, he argued, abridged his First Amendment rights. The Arkansas-born and Alabama-raised electrical engineer makes a good living. Though rich, McCutcheon cannot be counted among the super-rich. “I do not come from a political family, and I do not come from a rich family,” McCutcheon told Politico. “I understand that Republican politics is a lot of family business, but I’m not that.” He is the CEO of Coalmont Electrical Development, which has twenty full-time employees. McCutcheon promotes commerce—he began Coalmont in 1996 and has built it up since then—and believes that government should be fiscally responsible. Perhaps that explains why he chose to serve as the finance director of the Jefferson County Republican Executive Committee. He is also the chairman of the Conservative Action Fund, a political action committee (PAC) that advances the messages and goals of conservative Republicans. In 2012 he lost his bid to become an Alabama delegate at the Republican National Convention for Mitt Romney. But that in no way dampened his commitment to conservatism. At forty-six, Shaun McCutcheon is no status-quo man. “He wants change,” Chris Brown, an Alabama Republican political consultant, told USA Today. “He wants guys who are going to shake it up.” Much to the same effect, he described himself to the Washington Post as “just another political activist trying to change the world.” To that end, the politically active bachelor contributed almost $384,000 to federal candidates, committees, and parties in the 2011–2012 election cycle, according to the Center for Responsive Politics. But McCutcheon wanted to do even more. Acting as an individual (and not a corporation), he aimed to give more of his personal money to the Republican National Committee (RNC), the National Republican Senatorial Committee (NRSC), and the National Republican Congressional Committee (NRCC), as well as to conservative candidates and PACs. A three-judge federal trial court sitting in the District of Columbia, however, saw that matter differently. On September 28, 2012, the tribunal ruled against McCutcheon’s challenge to the federal law. “It is not the judicial role to parse legislative judgment about what limits to impose,” the judges concluded. Writing for the court, Judge Janice Rogers Brown nonetheless conceded that “the constitutional line between political speech and political contributions grows increasingly difficult to discern.” Hoping that appellate jurists would act more favorably on this concession, McCutcheon took his case to the highest court in the land. On February 19, 2013, the Supreme Court agreed to hear McCutcheon v. Federal Election Commission. Oral arguments in the case were set for October 8. When the McCutcheon case was filed in the Supreme Court, nine states had laws restricting aggregate contributions, though the state laws were not at issue here. 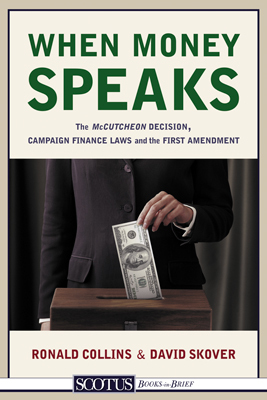 Against that backdrop, Shaun McCutcheon found himself in the eye of a political storm over money and elections—a tempest that had been building momentum ever since the Supreme Court decided in 1976 that “money is speech.” The hurricane raged with even greater force when in 2010 the justices held that the First Amendment protected corporations and labor unions in making independent campaign expenditures. That was the controversial Citizens United decision. Jeffrey Toobin, writing in the New Yorker, was troubled by that decision and what might follow: “Think the Supreme Court’s decision in Citizens United was bad? A worse one may be on the horizon.” Fred Wertheimer, a campaign finance reformer and president of Democracy 21, agreed: “As damaging as Citizens United has been to our political system, the Supreme Court would make a bad situation far worse if it strikes down the overall contribution limits [required by federal campaign finance laws].” David Savage of the Los Angeles Times couched it this way: “In what may be Act 2 in the decline and fall of campaign funding laws, the Supreme Court appears poised to lift the lid on the total amount the wealthy can give directly to all candidates and political parties.” The case “on the horizon,” the “Act 2” case to which they were all referring, was McCutcheon v. Federal Election Commission.